Pharmacy of America was founded to offer an unparalleled customer service and patient care. What started as a single location in 2009 has grown to six locations, making it the fastest growing independent pharmacy in Philadelphia. We are proud to complement the services of our local healthcare providers through accurate and expedient prescription dispensing, as well as consultative and medication therapy management services. Our efficient team of pharmacists and technicians strive to provide prompt and friendly service. Quality and accuracy are values we refuse to compromise. We actively seek out programs designed to lower your drug and healthcare expenses. Whether your concern is price, dealing with your insurance company or just understanding your options, Pharmacy of America is here to help! The Mission of Pharmacy of America is to provide comprehensive pharmaceutical care to the residents within its trading area. This will involve emphasis not only on the availability of quality drug products and health care supplies and equipment, but more importantly, the availability of a qualified professional pharmacist to counsel patients, monitor drug therapy, and assist physicians and other health care professionals in maximizing the quality of these patients’ health care. Emphasis is placed on educating patients concerning their medication not only to ensure compliance, but more favorable health care outcomes. Pharmacy of America will also serve the community as a valuable health care resource providing a triage function referring ill persons to other health professionals or providing advice and counsel for self-medication with non-prescription drugs or other therapies. It will also serve as a wellness center providing information, counsel and products to promote the maintenance of health and a healthy lifestyle. In too many cases, retail pharmacy has become more a business than a practice. I founded Pharmacy of America to bring back the values of ‘the good old days’. A pharmacist should be a true member of the community, provide personalized service, sincere care, knowledgeable advice and products at an affordable price. I and my team have an unwavering commitment to this level of care. Pharmacy of America provides a unique blend of old fashioned values and modern day care. We have invested in the best of technology, industry leading processes and ongoing training to ensure our customers received and unparalleled experience. We promise to provide our customers product selection with variety, value, consistency and convenience while maintaining a superior level of personalized service and care. You are always welcome to experience the best pharmacy service and care. It’s Pharmacy of America’s vision of doing business. Farah Khokhar, Director of Pharmacy Operations, Bachelor of Science in Pharmaceutical Business. 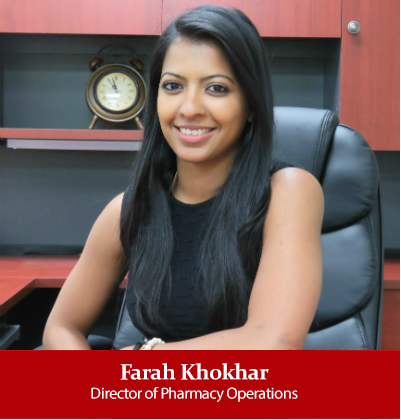 Farah Khokhar was a pharmacy student when she joined Pharmacy of America in 2011 as a part time Pharmacy Cashier, with a mission to start her journey in the pharmacy world with a goal to be a pharmacist. Within a year, Ms. Khokhar was promoted to a Pharmacy Technician and again to a Lead Pharmacy Technician. In 2013, Ms. Khokhar was promoted to a Pharmacy Services Supervisor. Ms. Khokhar held a Bachelor of Science in Pharmaceutical Business along with a Bachelor in Business Administration. With her business background, Ms. Khokhar could not stay away from the business side of the pharmacy world and knew she is definitely a business woman and not a pharmacist. Having developed exceptional overall pharmacy management skills, she became the Executive Assistant of Pharmacy of America in 2014. In 2016, Ms. Khokhar was promoted to Director of Pharmacy Operations making her the second person in command of a multi-million-dollar company. Ms. Khokhar is recognized for her leadership, strategic planning, compliance management, project management and business development. Ms. Khokhar's goal is to lead Pharmacy of America into achieving all of its strategic growth plans. Ms. Khokhar strongly believes in Pharmacy of America’s mission and vision of being a good company that treats its people as friends and family. 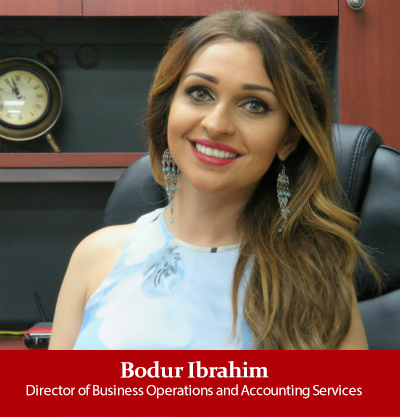 Bodur Ibrahim, Director of Business Operations and Accounting Services, Bachelor of Business Administration. 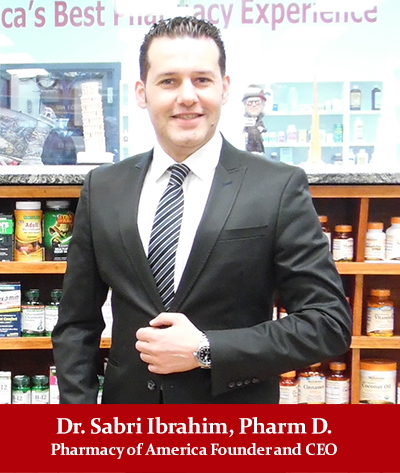 Bodur Ibrahim joined Pharmacy of America in 2015 as an Administrative Assistant. In 2016, Ms. Ibrahim was promoted to Director of Business Operations and Accounting Services. Ms. Ibrahim holds a bachelor degree in Business Administration. Prior to joining Pharmacy of America, Ms. Ibrahim had five years’ experience as a team leader in charge of accounting and billing for a large medical practice. In addition to those responsibilities she was assisting surgeons and physicians in handling and monitoring their personal expenses. Ms. Ibrahim is also an expert in managing Front End operations. Ms. Ibrahim is responsible for managing Front End sales, merchandising, programs and staff. Ms. Ibrahim is also responsible for payroll and accounting at Pharmacy of America. Ms. Ibrahim’s goal is to continue growing her professional career and achieve higher leadership positions by expanding her knowledge and experience in the pharmaceutical retail industry at Pharmacy of America corporate.